Two posts in one day...I'm making up for lost time! 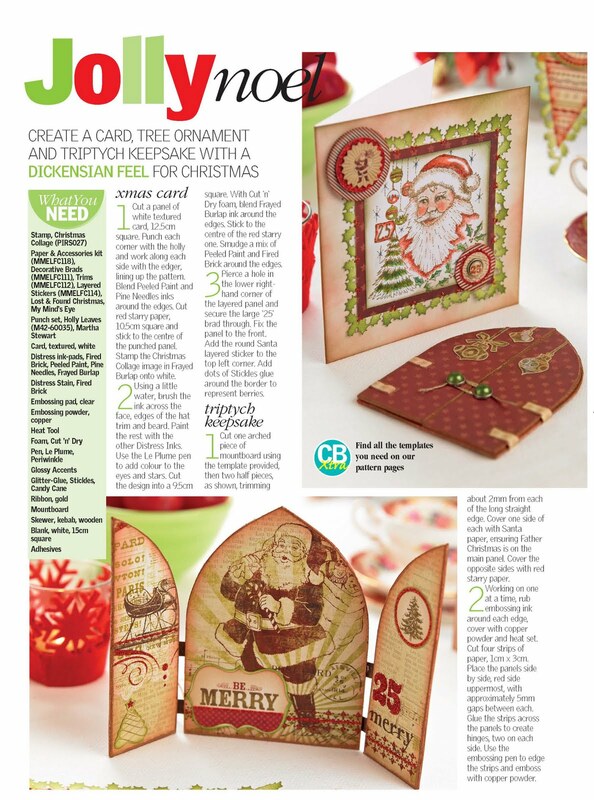 I just thought I'd share these pictures of some new projects that I did for the November issue of Crafts Beautiful magazine using the beautiful My Minds Eye Lost & Found Christmas collection. The papers are a really lovely mix of quite vintage images and colours but with a modern twist and a good lashing of glitter! 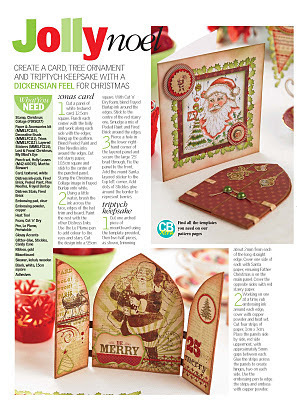 I also used the matching brads and dimensional stickers as well as my Christmas Collage stamp for the card's focal image. I have to thank my big sis, Heather, for suggesting I make a Bunting decoration! I really liked the way this turned out and I was especially pleased that I was able to use the MS Holly border to punch around the triangular shape. Certain of the punches will allow you to be a little more experimental and daring with how you use them. So long as you hold the punch upside down then you can check that you aren't cutting through an area you've already punched - I also found it easier to start at the point at the bottom as this one is harder to punch around otherwise. I have found (by accident!) that I can also use this particular PATP set to punch around squares and rectangles that aren't the standard size, simply because the holly leaves are a fairly random pattern. It's also just a really lovely design that I like using! The Triptych is made from a base of mount board and is really simple to make. Embossing all the edges with gold powder takes extra time, but is worth it for the extra neatness and stability that it adds. Patterns are included in the magazine of course, and you could enlarge or reduce this...I quite fancy making some Triptych ATC's. Hope you like them. 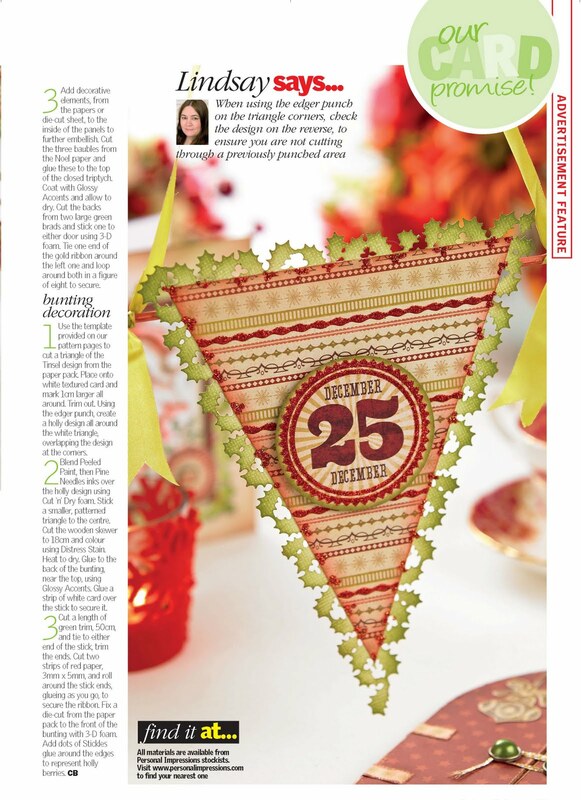 If you want any more details about Crafts Beautiful, just check out the link in my sidebar. I've had a nice day colouring in, so I have a little stack of images now, all ready to add to my backgrounds and cards this weekend. Hope to see you in Essex! Thank you for two days of very informative demo's. I enjoyed them both. Apologies for the expletive when my phone rang twice within moments.